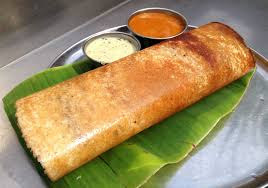 Masala dosa or masale dose is a variant of the popular South Indian food dosa,which has its origins in Tulu Mangalorean cuisine made popular by the Udupi hotels all over India. It is made from rice, lentils, potato, methi, and curry leaves, and served with chutneys and sambar. Though it was only popular in South India,it can be found in all other parts of the country and overseas.In South India, preparation of masala dosa varies from city to city. Masala dosa is stuffed dosa. The two parts are the dosa and the stuffing. The dosa is made in the usual way by soaking rice and lentils overnight in water and then grinding it to a batter. The stuffing is made from boiled potatoes with a seasoning of mustard seeds and garnishing of grated coconut, coriander, and lemon juice. Mysore masala dosa has a red chutney made from red chillies, onion, and garlic applied to the inside of the dosa before placing the potato stuffing on top of it. Typical ingredients include rice, husked black gram, mustard seeds, fenugreek seeds, salt, vegetable oil, potatoes, onion, green chillies, curry leaves, and turmeric.